"Four candles or fork handles?" 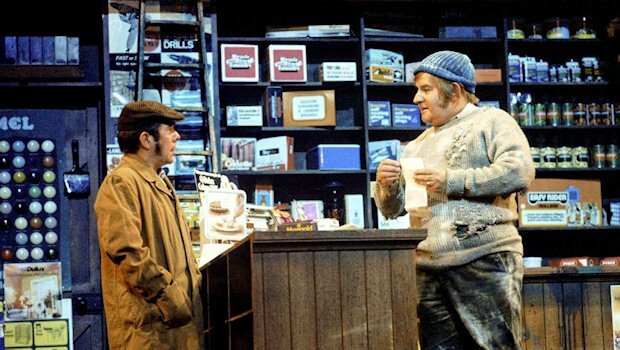 The Two Ronnies illustrate the futility of traditional procurement. Watch Four Candles on YouTube. There's a well-worn procurement process used by buyers to reduce risk, save time and money. Its aim is to evaluate the market and select the best provider available balancing quality, cost and timeliness. Determine need. Write your CRM requirements specification and obtain stakeholder approval. Engage with potential providers. Write a request-for-proposal (RFP) with lots of evaluation questions. Include a generic, draft contract and a CRM requirements specification. Perform a market scan and select a long list of potential suppliers. Send your requirements specification and RFP to the potential suppliers and give them a couple of weeks to respond. If you are a public sector organisation you might need to publish your RFP so that anyone can respond to it. Evaluate providers. Grade suppliers' responses and ask the top two or three to perform a demonstration. Appoint supplier. Select the preferred supplier, and sometimes a spare. Negotiate a contract to implement your new CRM platform. Most CRM customers use this procurement process or something like it. I have used this approach once or twice as a CRM customer. More often, perhaps more than a hundred times, I have been involved as the potential supplier. And it sometimes works. It's better than random selection. But it's not a perfect process. Let's have a look at the challenges of the traditional procurement process. The fallacy of requirements. Your requirements specification has been written when you know the least about the problems you're trying to solve. There's a good chance you'll receive poor proposals and select the wrong CRM software if you have missing, incomplete, ambiguous or gold-plated requirements. Reliance on references. Many RFPs ask for several client references and case studies. Often the contact information requested is private and the project details are confidential. Even when great references are provided, there's little chance that the same team that performed the reference customer's project will be assigned to your project. The consultants that performed the reference project could even work for one of the other suppliers by now. Clarification questions. The best consultants ask great questions to clarify your requirements. Some buyers only accept questions in writing then circulate answers to all the suppliers. This creates an incentive not to ask any clarifying questions. Instead, suppliers make lots of assumptions while responding to the RFP. Relying on assumptions means that any solutions proposed and estimates given are likely to be inaccurate. Lack of qualifying information. You are more likely to receive proposals from the most suitable providers if you provide comprehensive RFPs that are easily qualified. Potential providers qualify your RFP by evaluating its quality, scale, risk, timetable, and complexity. Then they compare your project to their strengths and decide whether to participate or qualify out. This keeps down the cost of sale for the providers, and the cost of procurement down for buyers too. Too many RFPs omit important qualifying details such as the intended number of users, anticipated timescales or expected benefits. I once had a period of six months reading public sector RFPs and not one of them specified the number of CRM users. Some buyers even refused to specify the number of users when asked directly. This increases the chances of receiving unsuitable proposals. Some qualified providers will decide to qualify out and not to respond at all. No business case. RFPs rarely refer to a business case that states the desired business outcomes or quantifies the value of the expected benefits. So providers are left guessing about which features will have the most value and what budget will justify the investment. Who is the implementation team? Lots of RFPs ask for resumes of consultants that will implement the software. But there's usually little chance that the proposed consultants will be assigned to your project. You'll be spending significant amounts of time with the provider's CRM team on your project. But the people that you meet before then are CRM pre-sales consultants that don't work on implementation projects. Generic contracts. Draft contracts that are rarely suitable for CRM software and services are often included by procurement managers in the RFP. Each potential supplier has to have their legal counsel review the draft contract before they've even been shortlisted. Often the contracts are suited for software procurement but not consulting services or force suppliers into situations that unnecessarily drive up costs for the customer (such as forcing fixed-price engagements or customer ownership of intellectual property). The result is that small companies can't afford to bid. Only large, expensive providers can afford to respond. Traditional competitive procurement processes work well for acquiring goods and services in lots of industries. They have worked, and sometimes can work, for acquiring CRM software and services. But there are some better procurement practices we can use to engage better-qualified providers, to elicit better proposals from them, to increase our chances of selecting the best provider available, and to reduce the costs of procurement. Watch the legendary Four Candles sketch by the Two Ronnies if you want to witness all the challenges of traditional procurement in action. Tryouts involve working closely with potential providers for a couple of days or weeks. During this time, you can assess the outcome of their actual work instead of relying on proposals to evaluate their potential work. The idea was inspired by the CEO of Automattic holding auditions to build a strong team. Tryouts offer a chance for you to evaluate CRM software and the potential implementation team. You can tackle risky parts of our project early before they become expensive. And you can arrive at an implementation estimate based on a small piece of real working software. How does a CRM tryout process work? In a CRM tryout, we obsess over providers' ability to create valuable CRM software that delivers desirable business outcomes. Initially, we don't ask about the CRM providers' quality management processes, environmental management systems, or workplace health and safety policies. We look at those other qualities too, but they are secondary and come later in the process. Determine need. Write your CRM specification and obtain stakeholder approval. The CRM specification should describe your business case and provide a sense of the overall scope. It should describe at least one CRM process in detail so that potential suppliers can qualify your project and prepare a short demo. It doesn't need to be complete or accurate. Engage with potential providers. Send your requirements specification to your list of potential providers. Include your procurement criteria: quality, environmental, health and safety, financial. Let providers know they'll be assessed on these qualities later. Qualification and clarification call. Give providers a 30-minute call to ask their clarifying questions. During this call, you are evaluating each other. You'll eliminate some providers at this stage and some will qualify themselves out. Ask tough questions: based on their experience, how much does a project like this cost and how long will it take? What are the riskiest parts of the project? It's better to drop a potential provider after a 30-minute call than after they've spent 5 days writing a proposal that you've spent 5 minutes reading. Demo presentation. After the call, invite a short list of providers to give you a customised 30-minute demo of their software. Ask more tough questions. Your goal is to be able to go forward with two, perhaps three, CRM providers. Tryout workshops. : Run a couple of project kick-off workshops with one or two shortlisted providers. This is your opportunity to assess their real-world competence and the quality of their approach. The objective is to have a shared understanding of your project scope, requirements, and desired business outcomes. Timebox the workshops to between one and five days depending on the scale of your project. Tryout project. Run a short project with the preferred provider. This is your opportunity to assess their team members' ability to meet your initial requirements. Can they deliver your most valuable features? Can they mitigate your riskiest requirements? Timebox the project to between one and four weeks depending on the scale of your project. Appoint supplier. Your procurement team should be conducting their own evaluation and contract negotiation while you're running the tryout. Aim to continue the engagement with the CRM provider (if the tryout was successful). Aren't tryouts more effort than traditional procurement? In the initial stages, there is less effort for the CRM customer and potential providers. Both parties avoid the busy work that goes into preparing and responding to a request for proposal. As the field narrows and the tryouts begin then the level of effort for both parties ramps up. The tryout begins to feel like an expensive method of evaluation. But that's exactly what we want. We want customers who are serious enough about their CRM projects that they are willing to invest their time. We want providers qualified and motivated enough that they are willing to do what's necessary to succeed and passionate enough to make this potential project a priority. During the process, we try to collect and provide as much feedback as possible. The clarification calls and demo presentations are carefully scored so we can confidently eliminate providers as early as possible out of respect for everyone's time. The tryout process only works when there is open and honest feedback in both directions. The level of communication required is something that's difficult and often absent during traditional procurement processes. Diminishing the role of the request-for-proposal and letting so many potential providers directly engage the evaluation team will be a step too far for many procurement departments. But tryouts are not all or nothing. You can begin by adopting parts of the tryout process that might work within the culture of your organisation. Experiment with holding clarification calls, running tryout workshops or even a tryout project. Try out tryouts. I'd love to hear which parts of tryouts work you think might work and which won't in your organisation. Have you tried tryouts? Let me know if you'd be willing to share your story so that I can add some real world CRM tryout case studies.